What makes StoneTree® Precast Concrete Fences different? StoneTree® Fences are created with the customer in mind. Our distinctive vertical forming system allows for a textured design on both sides of the wall.The StoneTree® systems, created by AFTEC LLC, cut back on installation costs and allow for faster installation. These concrete fencing systems are unique to licensed StoneTree® manufactures and provide the most attractive precast concrete walls in the industry. The worldwide leader in cost-effective precast concrete fence wall production, handling and installation. High-quality, low-maintenance concrete fencing which provides beauty, strength, protection and durability to stand strong for generations to come. A green fencing product, because StoneTree® Precast Concrete Fences are made of environmentally-friendly concrete and do not interrupt the delicate balance of nature. 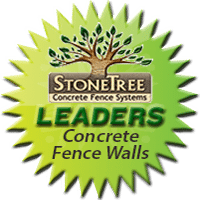 When compared to similar precast concrete fencing options, StoneTree® Concrete Fences are the clear leader in both quality and efficiency.